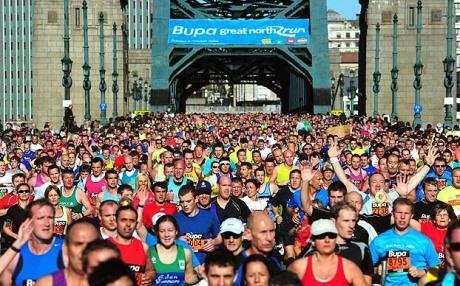 Andy Thompson and Liz Blezard both finished the Great North Run on Sunday 18th September 2011. Big Andy finished in 2 hours 8 minutes, just 18 months after breaking his leg and Liz finished in just over 2 hours (we’re not sure of the exact time yet.) They were spurred on by Huw and both raised a lot for his Trust. Congratulations on a great achievement to both of them. Here’s a bit more info about their day along with links to some photos. Andy however had the relative luxury of being bused in and out from the finish line and enjoying a pint at a local pub near the finish line. Both Andy and Liz felt great at the finish – the achievement of finishing a tough event and concious of contributing to a cause that was special to both of them. Liz had run the event a number of times in the past and enjoyed the run more than last year. She had prepared well and once again just felt glad that she finished – which she did without any walking – unlike some other runners in the event. Not only that but she was back at the gym on Tuesday night – for more punishment! Here is a link to Liz’s photos although she is only in the first one of the five shown as far as I can see. We are honoured, touched and grateful that Liz and Andy chose Huw’s trust this year – not only that they wanted to ‘do it for Huw’ but they also raised over £2,000 between them, some of which is yet to be added to the web site – so the total will continue to grow.